In the beginning was ‘The General’ Phil Thorpe, Ashley Peat, Tim Drinkall, Shannon Laffey, Phil Butterworth, Andrew Gibbs, Nick Wright, Lee Wilson, Simon Peel and Scott McElroy (sorry if we missed anyone). 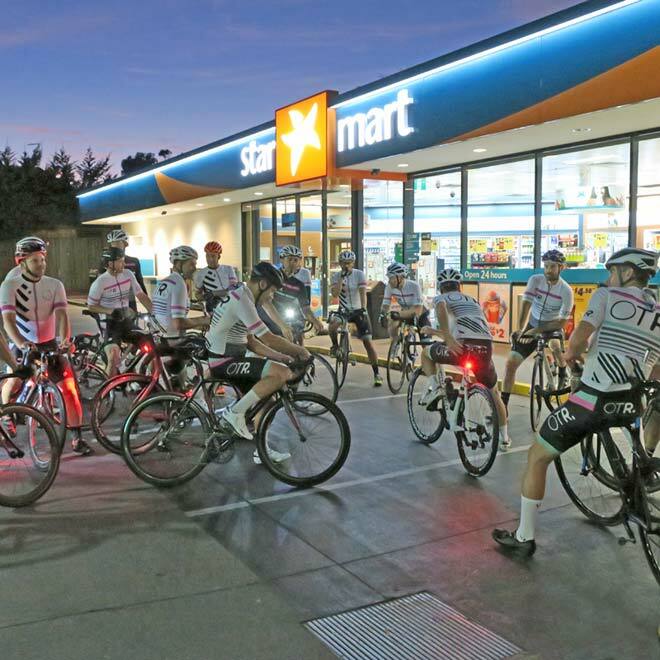 Two to three social groups (Ritte, Brown Cow & Jayco Flyers) and a few other local guys joined to form OTR. Lee and Ash used to inflict pain when Shannon was 20kgs heavier (hard to believe now). 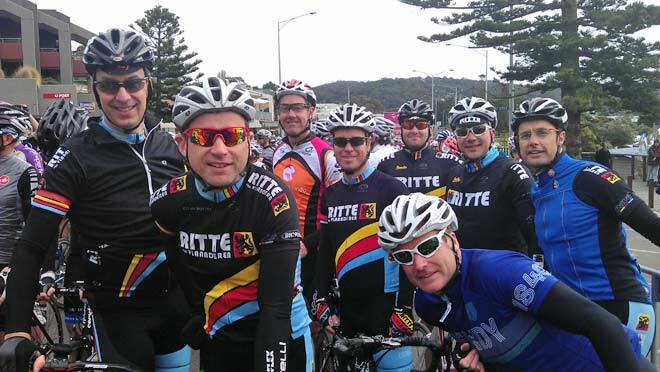 This was the first event as a team in the previous incarnation as Ritte (using the Vlaanderen Ritte kits from the US). So it was put to a survey and everyone added a whole bunch of names and someone came up with OTR - On The Rivet. 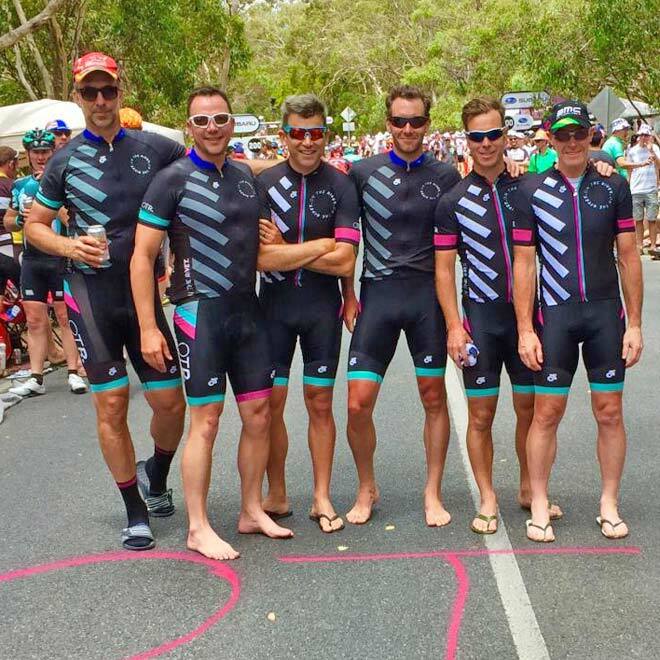 Shortly after sitting around in Adelaide, after watching the Tour Down Under and everyone wearing different jerseys, we decided to put together a custom kit. Lee and Ash knew a designer (graphic designer) who put the design together (and the brand) and it was put forward to the newly formed OTR committee, it got approval and off we went with version 1.0 of the custom OTR kit. 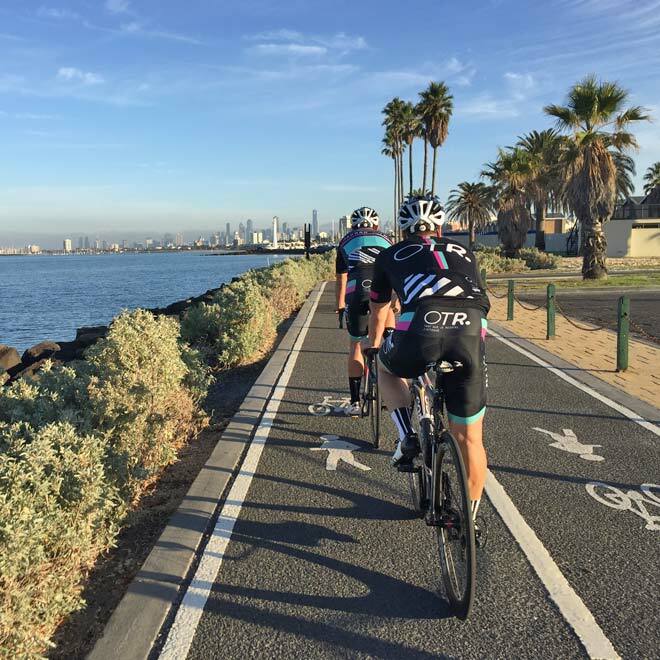 So with the first version voted the ugliest kit on Beach Rd, the second version was a bit of an upgrade and now onto version 5, which is produced by Melbourne-based sportswear company, Jaggad. Their signature colours of pink, (mint) green, grey, white and black will stand for a while. 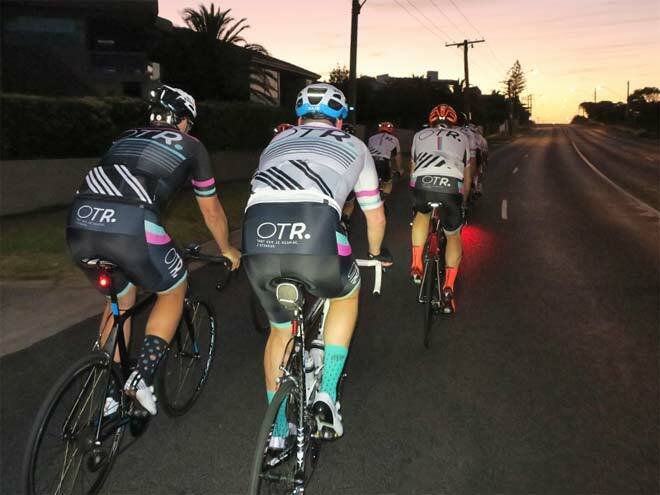 Like any group on Beach Rd, when you have been riding around for a while everyone gets to know who you are; there are the 6amers, Loco, CTX, OTR, TKM so in effect you do become a Beach Rd cycling brand. 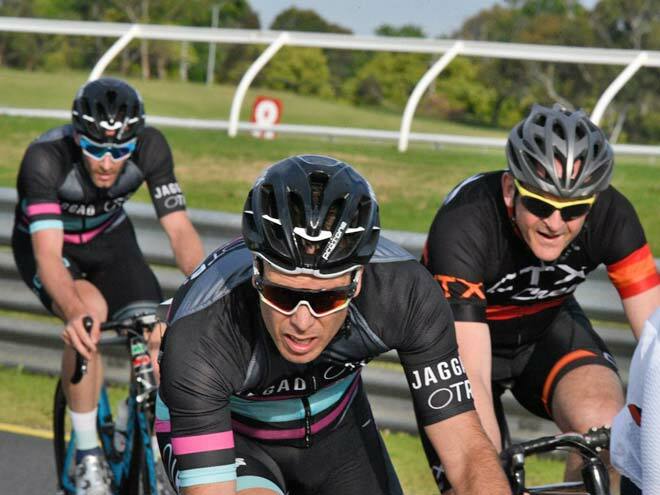 With a few riders in the group riding with and representing Jaggad, including Jaggad co-owner and CEO Steve Greene, it offers another channel to create a slightly different identity for those who do race called Jaggad OTR Racing, and now Jaggad has announced a fully sponsored team Jaggad Cycling Team in partnership with Giant South Yarra (GSY), Melbourne City Jaguar, Pure Blonde, Hocking Stuart, Spin Labs, Brown Cow and Bon Chapeau. 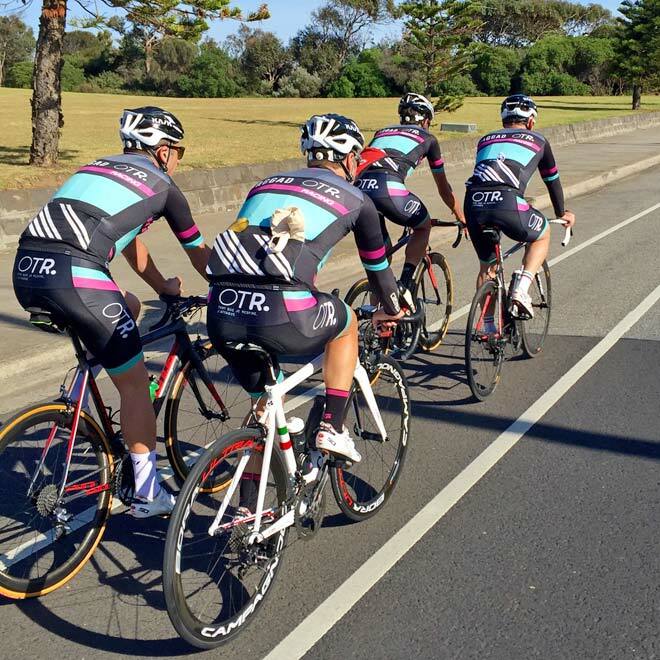 It’s a community based team that includes two OTR members, Shannon and Ash Peat. Steve and the team at Jaggad have been hugely supportive of OTR and we look to return the favor by representing OTR and the Jaggad brands in a way that encourages safe riding, community engagement and most of all not taking it all too seriously and having some fun. We often get a lot of people enquiring about the kits, with people wanting to get their hands on it. 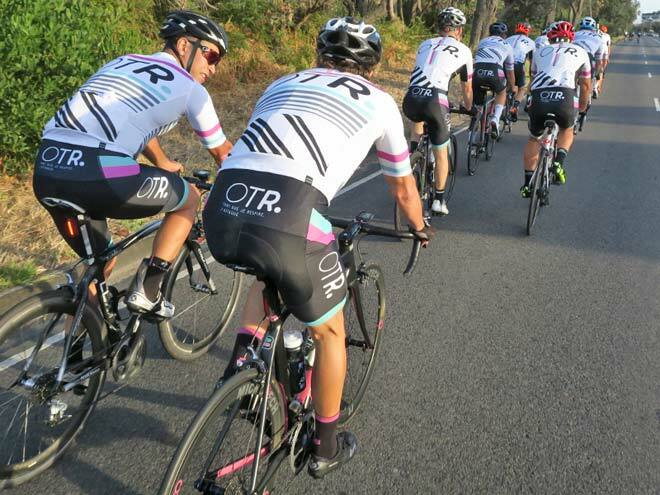 By everyone wearing the OTR kit it's easy to identify the OTR riders and maintain safety. 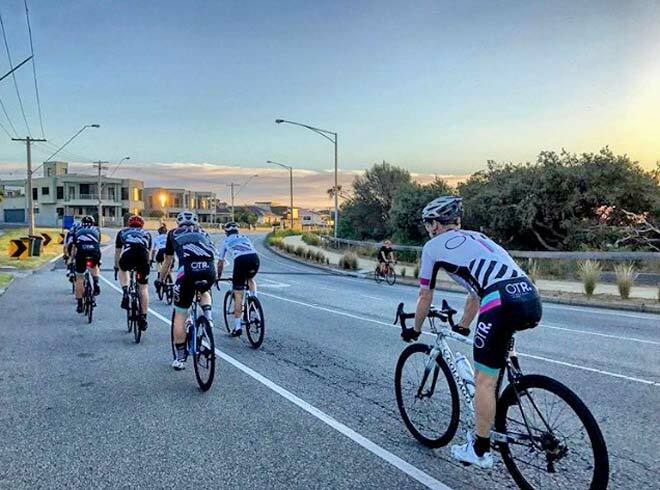 Each rider knows each-others ability to ride safely in a bunch, hold wheels, be predictable and safely perform rolling turns in the bunch. With riders spread across ride levels from A - C (local club racing grading) on Tuesdays they split the group into the fast (“Smacko”) and slow ride, Thursdays are social while on the weekends it’s about re-grouping and looking after each other and ride back as a group with the last few kilometres turning into a smash fest with UCI points on offer (laughing) but everyone knows where they are going; finishing at the Brown Cow Cafe in Hampton. We have a little bit of structure so everyone knows what they’re getting themselves in for. With Tuesdays it gives people the options that if they don't feel like smacking it they can join the other group. Just like any group on Beach Rd we like to have a bit of fun with it. 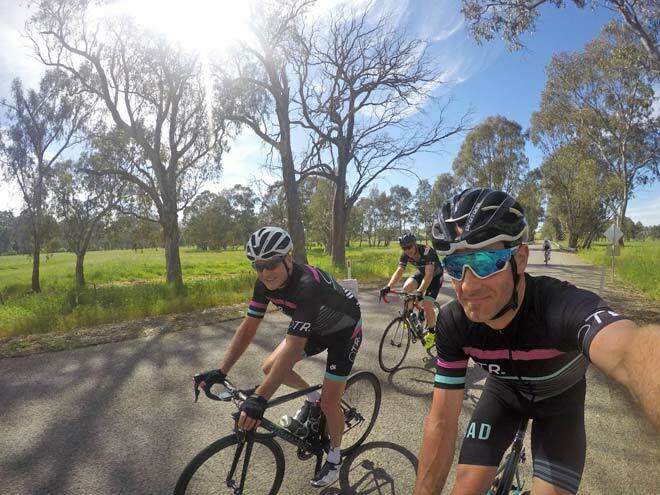 Some guys get a bit serious as well; we all like to have a bit of a crack and when we are rolling with the B Graders on the Tuesday ride, we have a bit of a laugh and everyone has a bit of fun with it. 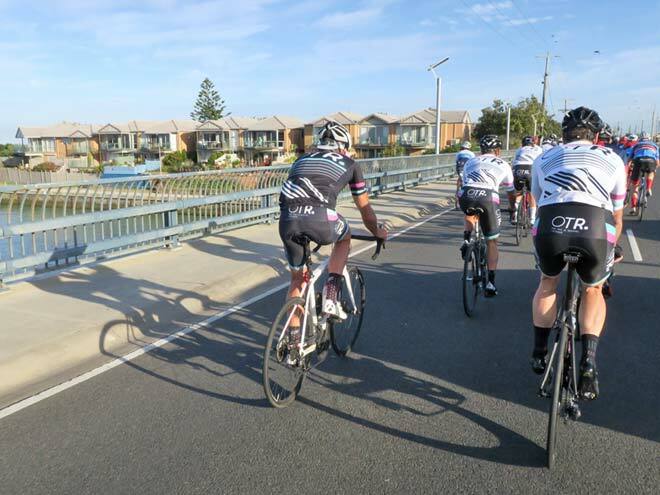 We have deliberately set out not to be a group of 50 (members) and are pretty comfortable with the size we have now of 30 members but consistently have 25 riders and a handful come and go. 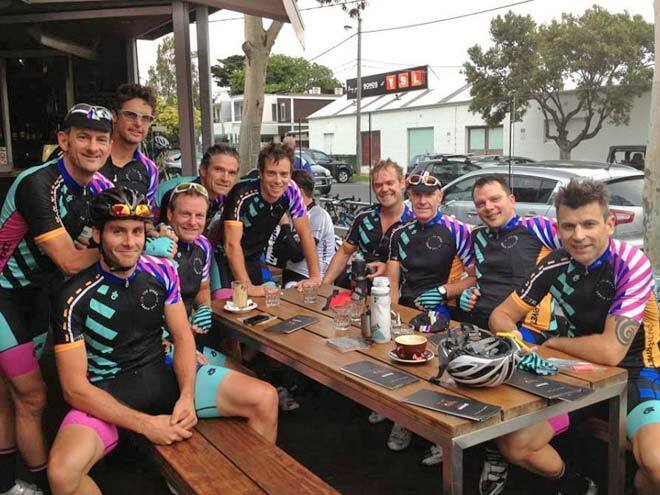 Nobody at this table, for instance, has a desire to see the group go to 50 - 100 so if someone is introduced to us (referrals or friends) and they ride regularly for a year or so and we get to know them, they join in with the group and they love their riding then we are open for new riders to join in. We would also like to have women in OTR as well but for now it's just panned out that way (all male riders). Every Christmas we have a get together where we give out awards across the group, which is a bit of fun, for instance; the “Clubman” (best and fairest) award. 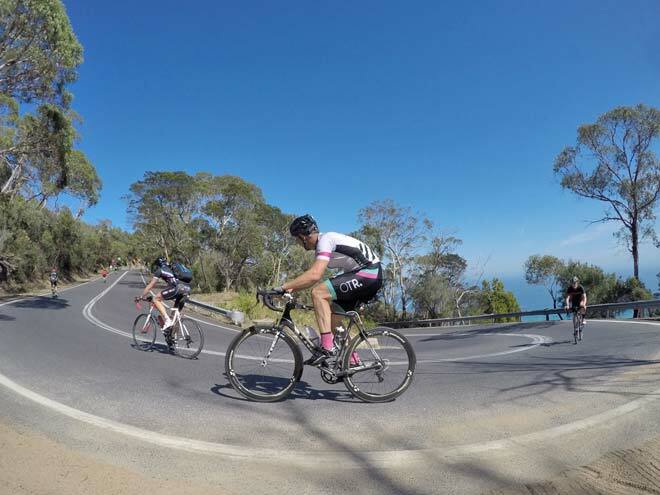 We also have trips away including Adelaide (Tour Down Under) and Amy's Gran Fondo and a few regular rec (recreational rides) will join in as well and have a good time and definitely we try to get off Beach Rd now and again (laughing). Once you dig a little deeper, it’s social and equally important that it's about a sense of belonging. 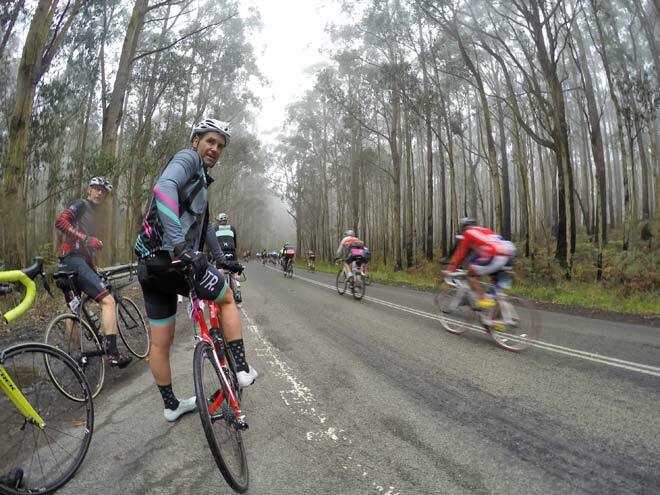 We have day trips where we go off Beach Road into the Dandenong’s with a few regular loops. Most of us have kids with sporting commitments, etc. so we work cycling around all of this and it's hard to get away especially during the soccer season and AFL (the footy season). 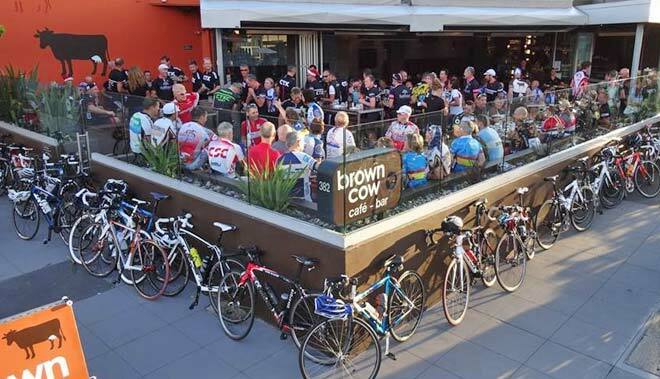 Julian, the owner of Brown Cow Café Hampton really supports cycling in the local community and is one of the best cycle cafes in Melbourne. We really enjoy coming here and feel very welcome and it’s added a bit of depth to what we do socially as well, which is really good. 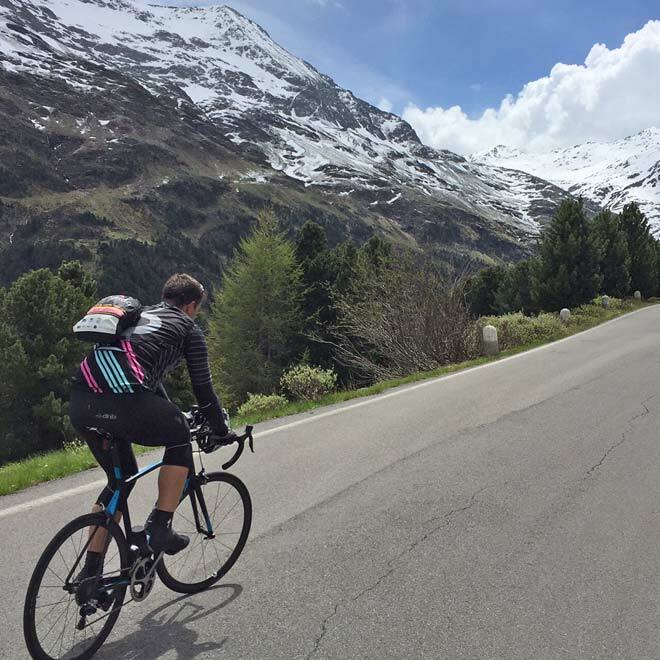 From the very start Julian has been there as a member of OTR and also supports a number of other groups, including the Brown Cow social group, CTX and the new Jaggad Cycling Team, which he has jumped on board as a co-sponsor. 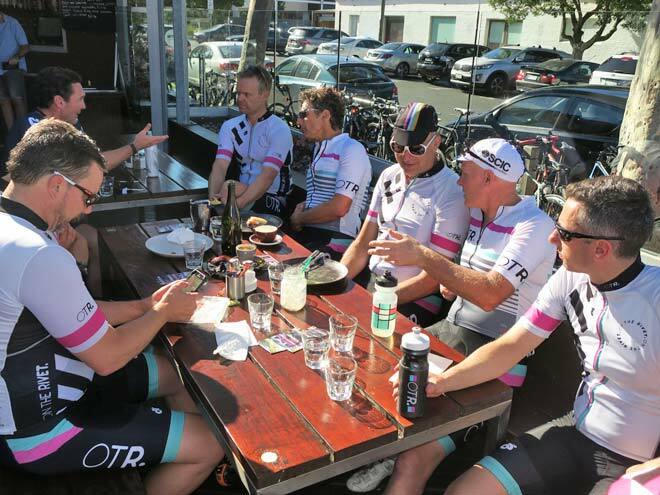 The attraction of OTR is the riders not taking it too seriously, just have fun on the bike, enjoy each other’s company and try to keep politics out of it. 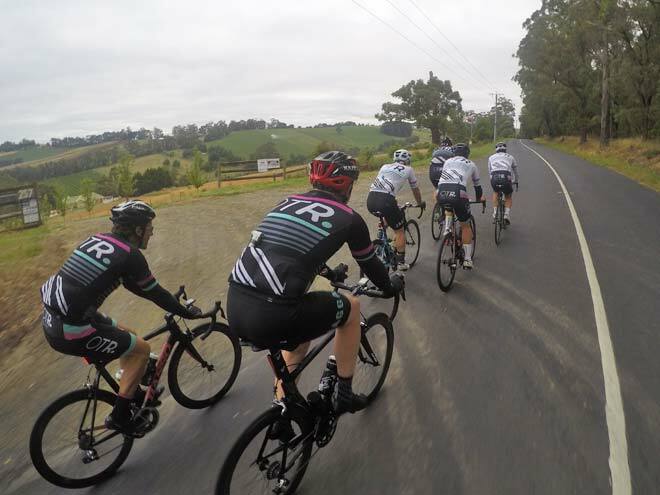 Riders travel from afar; Craig is from Moonee Ponds, Cashy (Martin Cash), drives from Berwick and Gibbo is from Ballarat (been with OTR from the start) and have been consistently riding for over 2 years so the mix is right. 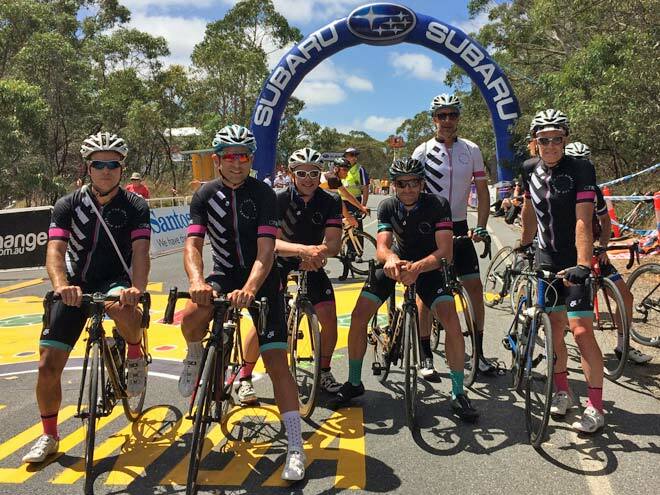 Craig, “I like getting flogged (laughing), they are good blokes, a good group to ride with, nice and safe’. 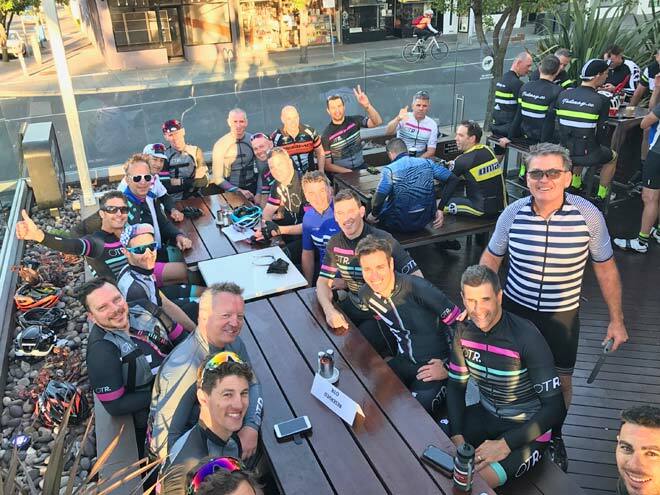 A few of the guys catch up outside of cycling and a few of the families know each other so it is broader than just cycling. Cycling is just such a big part of your life so there is no reason why your wife and kids can't come to some things as well. So, getting families involved is important as you cannot always be away. Some of the guys have been away to Europe for 2 - 3 weeks to Italy and France, when they can get away with it, as it’s a big commitment. 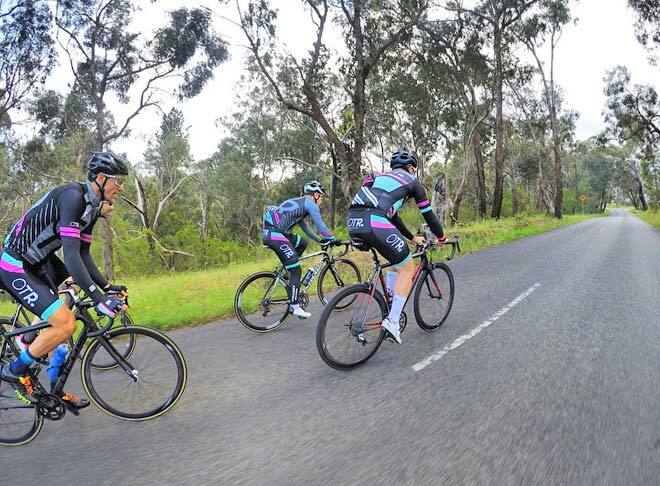 We’re planning some training camps around Falls Creek and we’ll try mixing it up with some more weekends away where you can bring your family, go off and do your ride or go away somewhere close for 2 - 3 days and have a good time riding.